How do you solve a problem like Colchester? The third week of the new Eastern Counties League saw seven of the scheduled 28 games called off, including all three of those due to be played in Division Three South. Some of the teams that called off have yet to play a game this season and you wonder if one or two clubs were overambitious in entering an extra side into the league. 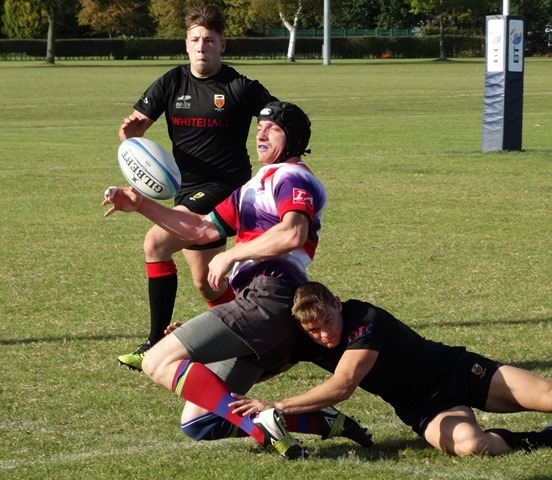 Only two sides scored more than 60 points this week, Cambourne Exiles in their first league game of the season, and Colchester II, whose 94-3 win over Mistley has sparked a flurry of debate after I posted photos of the game on Facebook. You can view the comments by clicking here and there are more at this link (you will need to scroll past the photos). Click on both links and read what peoples’ thoughts are about Colchester’s dominance of Division Two South; some are angry that they have been placed at this level, some understand that it isn’t the club’s or the players’ fault, and others have suggested some possible solutions. I know that the Competition organisers read these comments and they will take them on board. Colchester are very strong at the moment with all four adult teams in the top two of their respective leagues. Watching the second team on Saturday I recognised several players who regularly play for Colchester’s first team, and such is the size of their squad that the coach may be rotating them or more likely making them compete for their places. This of course means that they will be trying even harder to put in a good performance when playing for the second string. However, I’m not convinced that this will necessarily mean that the team will be so dominant throughout the season. Every club suffers from player injuries and often it is the strength of the second team that allows a first team to continue to play well. Colchester is no different and as the season progresses, second team players will be pulled up to the first, thirds to the second, and so on. In other Facebook threads there has been speculation that winning games so easily will encourage players to play for other clubs, but I’m not so sure. A major reason why people play rugby is to play with your mates, and with so many players coming through the youth system at Colchester most of them want to stay together with some moving to their home town clubs if they are from Harwich, Clacton, Brightlingsea, Mistley or Mersea Island. When the new leagues were published it was always said that it will take a season or two for things to settle down while teams find their level. It is almost certain that Colchester II will win the league and get promoted to Eastern Counties One where they will face stiffer opposition, and there are teams that are struggling that will find life much easier in a lower league. For now, Colchester II’s results are getting the attention but my feeling is that on the whole the leagues are working, reducing travel and generally providing competitive games. That will only improve next season. I have read this article and have to disagree with some elements. The main point of Eastern Counties leagues and with all leagues for that matter, is for clubs to play against sides where the game is generally competitive, thus making the game enjoyable for all. It was clear from the outset that when the revised eastern counties leagues were agreed, and in particular EC2, everyone associated with this league knew that it was a case of, let’s fight for 2nd place! I appreciate the reason for trying to reduce travelling etc, but not at the jeapody of players enjoyment and health to some degree. If what you say is true and Colchester will no doubt win the league where they will face tougher opposition in EC2, why on earth did you not start them in that league. Having played locally against sides in both EC2 and EC1 over the past 12 years, Colchester 2’s are better than any side in EC1 now! Playing against a side such as Colchester and being stuffed by 90 points is not enjoyable, demoralising to players and takes the fun out of playing. Surely you can see this! No disrespect to all other clubs in EC2, but Colchester are the most professional due to their continuing success at First team, and therefore there players are fitter, stronger and conditioned to play at a much higher level of rugby. I think it is fair to say that most clubs in EC2 due to their size and very small catchment area, don’t have any aspiration of breaking into London Leagues and the players just want to have some fun, banter and enjoy what is left of their rugby careers!